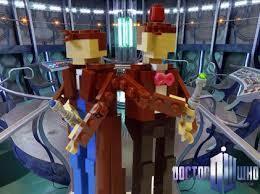 Doctor Who is coming to Lego, and as both a Lego geek and a Dr Who fan this is a time I can't wait for. Looks amazing doesn't it? This set was chosen from the Lego Ideas, which if you not aware is a site which allows fans to submit projects, and if it gets 10k votes, it has the possibility of being turned into a real set. Previous Lego Ideas sets have included Ecto 1 from Ghostbusters, the Big Bang Theory, Exo-Suit by Peter Reid, A collection of birds. Quite a few projects were submitted after Lego announced it was now accepting projects. Previously Character Building had the licence, thus there was no point in submitting ideas. I am not normally a fan of non Lego based mini figures but I did have to get this! To me it is the perfect match, the interesting thing is will it just appeal to people like me, AFOLs who grew up watching Dr Who as a kid, or will the kids of today like the idea of building their own Tardis. I hope so.